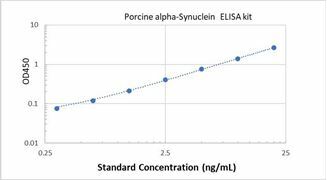 Specificity This assay has high sensitivity and excellent specificity for Porcine alpha-Synuclein. No significant cross-reactivity or Porcine alpha-Synuclein and analogues was observed. 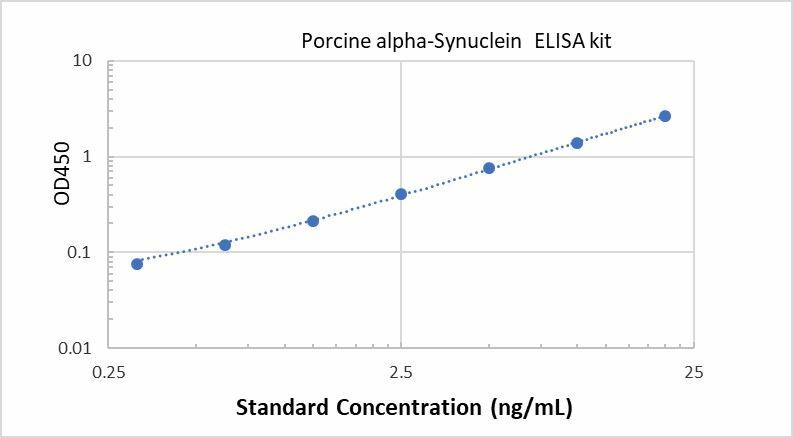 Typical Data ELISA: Porcine alpha-Synuclein ELISA Kit (Colorimetric) These standard curves are provided for demonstration only. A standard curve should be generated for each set of samples assayed. Background Alpha-synuclein is a protein that, in humans, is encoded by the SNCA gene. It is abundant in the brain while smaller amounts are found in the heart, muscles, and other tissues. In the brain, alpha-synuclein is found mainly at the tips of nerve cells (neurons) in specialized structures called presynaptic terminals. Within these structures, alpha-synuclein interacts with phospholipids and proteins. Presynaptic terminals release chemical messengers, called neurotransmitters, from compartments known as synaptic vesicles. The release of neurotransmitters relays signals between neurons and is critical for normal brain function.